In partnership with UNESCO, INGSA held a meeting in Apia, Samoa March 29th to 30th 2017 with representatives from Pacific Small Island Developing States (SIDS) to assess the needs and options for bridging the gaps between science and policy-making in the Pacific SIDS, in the framework of the challenges of achieving the Sustainable Development Goals (SDGs). 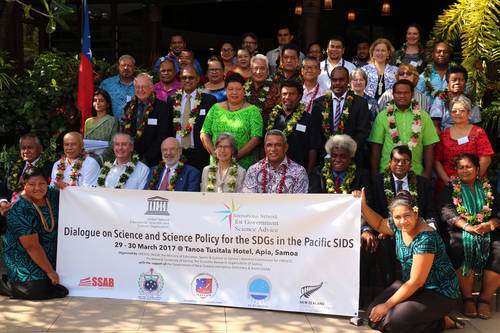 This preliminary meeting provided an opportunity for dialogue amongst the Pacific SIDS representatives and international organisations about the ways in which science advice mechanisms – both national and regional – could be put in place in the region. Through the discussion of practices, participants were able to explore the main aspects of science advice to policy making, and unpack the particular characteristics of the Pacific SIDS in this regard, with a view to developing an appropriate capacity building opportunity in the region.